Affinity Health Services would like to congratulate a senior community affiliate for successfully achieving their census mark for 2016. Thank you to all of the employees for your dedication in providing quality of care to our residents! 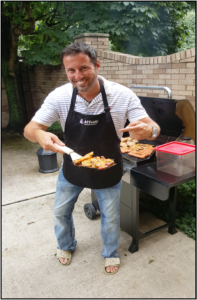 Pictured above is Chef Bob making true on his challenge to cook for employees who achieved their goal! 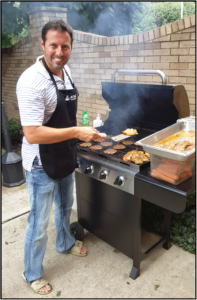 Employees enjoyed chef Bob sweeping over the grill and their golden achievement! 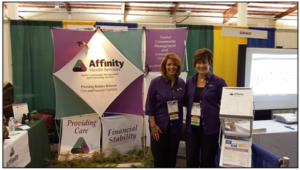 Affinity Health Services participated at this year’s 2016 County Commissioners Association of Pennsylvania – Annual Conference and Trade Show held at the Split Rock Resort. This conference was a great opportunity to enhance collaboration with various healthcare professionals and learn about the changes and innovations occurring in the industry. 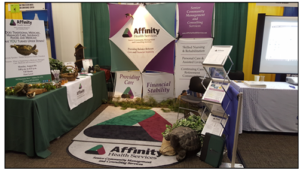 On August 8th, Denise McQuown-Hatter, President/CEO presented about What is Happening to Medicare, Managed Care, Medicaid and Insurance Payers which correlated with this year’s Affinity booth theme. Pictured above is Kimberly Kelly-Clutter, Director of Marketing & Business Development and Denise McQuown-Hatter, President/CEO at this year’s booth. Affinity Health Services proudly welcomes our new Financial Consultant, Garet Weston to the management team. Garet began his career in Public and Tax Accounting prior to entering Long Term Care. In addition to his three years as Director of Finance in a skilled nursing facility, Garet has provided financial services in a Personal Care Home setting. He has acquired experience in multiple customized software systems and managed the IT coordination for a fully implemented EMR. Additionally, Garet has the experience as a billing specialist performing billing for all third party payors, conducted internal audits and implemented Collection policies and procedures for Affinity clients. Garet has his Master’s in Business Workforce and Development from Indiana University of Pennsylvania and a Bachelor of Science Degree in Accounting from Clarion University of Pennsylvania. Garet is a certified USA swim coach and currently serves as the Indiana High School Head Swim Coach. Additionally Garet is very active in Relay for Life, Make a Wish Foundation and is a volunteer football coach. Affinity Health Services proudly welcomes our new Clinical Consultant, Teresa Toth to the management team. Teresa has been in long term care for over 20 years as an RN, MDS Coordinator, Senior Regional Clinical Reimbursement Manager, Director of Case Management and Clinical Consultant. Teresa has attained reimbursement experience spanning Pennsylvania, Ohio and West Virginia. Teresa developed and has directly supervised the case management process for 30 skilled nursing facilities as well as the clinical reimbursement management of the MDS process and the medical review process. Teresa developed and trained the MDS process and the LTC reimbursement relating to Medicare, Managed Care and Medicaid for a large for profit organization. She brings with her a working knowledge of Managed Long Term Services and Support (MLTSS) which is being implemented in Pennsylvania beginning in 2017. Teresa is a member of Pennsylvania Association of Nurse Assessment Coordinators (PANAC), is past President and has served on the Board. She currently serves on various PANAC committees. Teresa is a member of American Association of Nurse Assessment Coordination (AANAC) and the American Association of Managed Care Nurses (AAMCN). She serves as a board member of the America’s 9/11 Foundation, non-profit organization dedicated to supporting active military and first responders.